Consider planting dwarf varieties of peach trees if you're short on space. Dwarf peach trees typically average 8 to 15 feet tall at maturity, and semi-dwarfs grow anywhere from 12 to 20 feet in height. Dwarf peach trees are well suited for small landscapes or containers. They usually bear fruit earlier than taller cultivars, and are easier to reach for harvesting and pruning. Scarlet Prince (Prunis persica) is a very adaptable dwarf variety of peach tree that tolerates a wide range of well-draining soils. It is well adapted to grow throughout USDA planting zones 5 through 8. 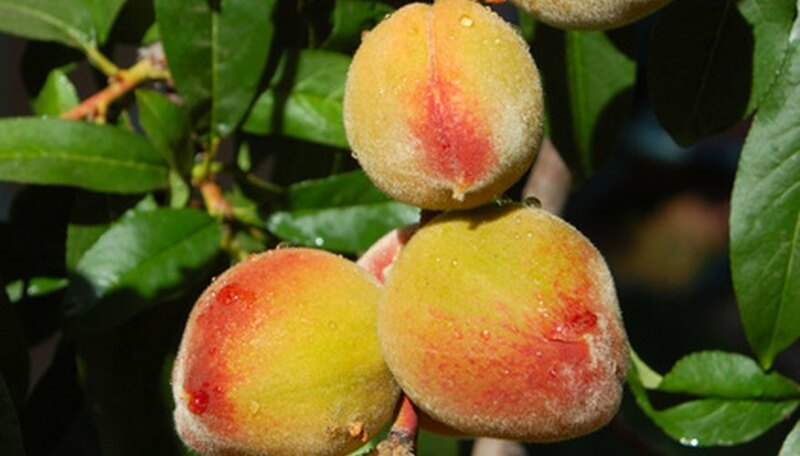 At maturity, this dwarf peach tree reaches from 10 to 15 feet in height with an average spread of 5 to 10 feet. It prefers full to partial sunlight for the best growth and production of fruit. The tree fills with fragrant pink blossoms in springtime. Scarlet prince produces fruit earlier than other dwarf cultivars. Fruits are usually ready for harvesting in June. Trees are relatively drought-tolerant but perform best with regular watering. Scarlet prince is grows well in small gardens or as a containerized patio plant. Dwarf red haven (Prunis persica) is known for its tasty, large fruits that are generally ready for harvesting in June. Trees grow well throughout USDA planting zones 5 though 9. Dwarf red haven is a suitable choice for gardeners living in locations that are too hot for other cultivars of peach trees. Two trees are required in the landscape for proper cross-pollination. At maturity, the tree reaches to 15 feet in height with a spread of 10 feet. It prefers full to partial sun for the best growth and production of peaches. It is adaptable to a wide range of well-draining soils. Pink, fragrant flowers fill the tree in springtime. Dwarf Red Haen trees have a good drought-tolerance but will look, and produce, their best with regular applications of water. Honey babe (Prunis persica) is a genetically dwarfed peach tree that grows up to 5 feet in height. The tree is well suited for growing in smallish landscapes or as a patio fruiting tree. The honey babe tree blooms in late spring with fragrant, pink flowers and produces large, sweet peaches ready for harvesting in late July. This slow-grower is well adapted for USDA planting zones 6 through 8. Trees are self-pollinating, so a second tree is not required for fruit production. Honey babe tolerates a wide variety of well-draining soils and prefers growing in full sun with average water requirements. Trees usually start producing peaches when they are approximately 3 years old.